Originally cramped by a dense laurel hedge and lacking space for comfortable outdoor seating, this pocket garden in the Friendly neighborhood of Eugene, Oregon was once a neglected corner of our clients' large lot. Our clients love to cook, so creating an outdoor dining area off of the indoor kitchen and dining space was a natural choice. 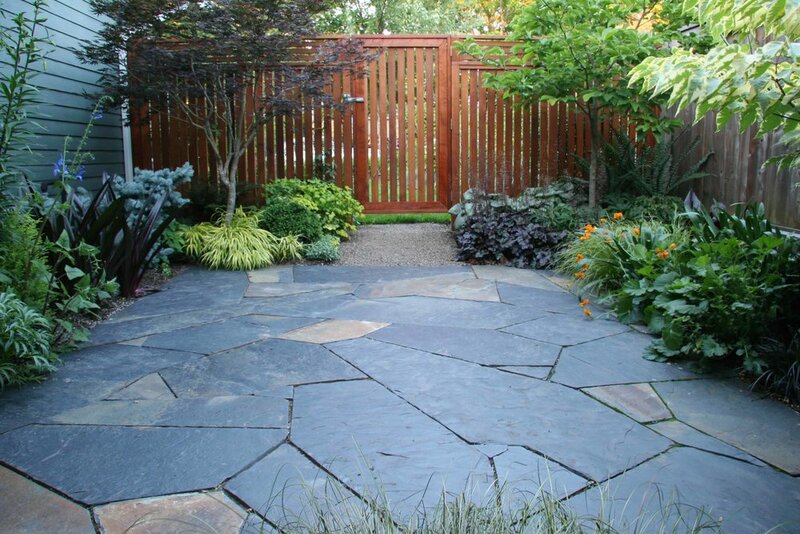 Although the space is small, Mosaic constructed a flagstone patio large enough to comfortably seat four. We designed the custom powder-coated metal table and chairs to give the space focus and an energetic final touch. Originally, the garden was more colorful, but a trip to the Japanese Garden in Portland inspired our client to request a greater focus on serenity and foliage texture. An open-slat redwood fence allows a play of light and air through the space while still providing privacy from a busy residential street.